Dropbox was one of the applications that my Galaxy Note II phone shipped with by default. It was installed by default and all I had to do was sign in to my Dropbox account to start using it. I have to admit that I'm not really using it for much on the Android phone. I do have configured it to automatically add screenshots that I take to my online storage so that I can access them on other devices right away which helps me a lot when I'm writing about a new feature or reviewing an Android app. A long tap switches to a mode that you can use to select multiple photos at once. 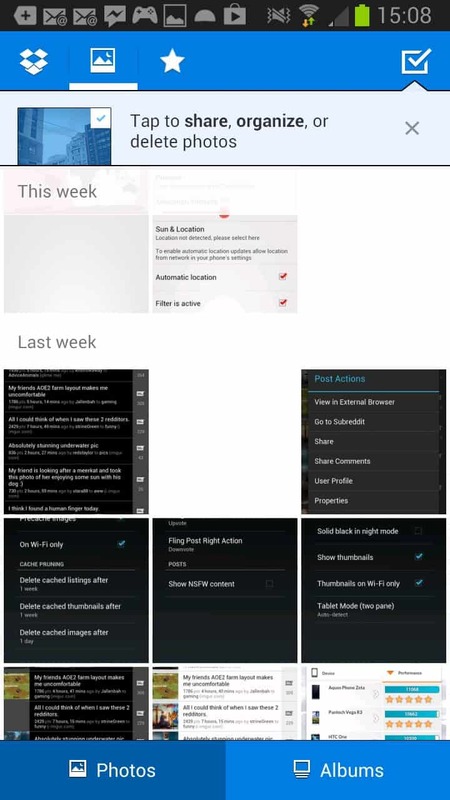 Actions are displayed in a small bar on top that you can use to share the selected photos, add them to an existing or new album, or delete them right away. The feature is relatively easy to use so that you can manage photos using the app comfortably. Dropbox recently improved the photo feature of its cloud synchronization service likely with the help of the Snapjoy team that the company acquired in December 2012. The photo improvement is not the only new feature that Dropbox integrated in to version 2.3.5 for Android. The developers added support for several new interface languages including Russian, Traditional and Simplified Chinese, Polish, Malay and Indonesian. The change log lists "tons of performance improvements" as the last change in the new version. You can download the latest version of Dropbox from the Google Play store, or by opening the Settings in the app itself and using the check for updates button listed there to do so.